After the Nvidia keynote at Computex 2018, in the post conference press call, Nvidia's CEO said that PC enthusiasts would have to wait "a long time from now" until new GeForce cards launch. A few days earlier we had noted that Nvidia had scheduled a Next Gen Mainstream GPU talk for August, at the Hot Chips Symposium. The two news stories, linked immediately above, didn't seem to gel, as August isn't that far away. With regard to the Hot Chips presentation it is interesting to see that the scheduled talk from Nvidia has now been removed. Instead, if you head over to the conference schedule page, and select the Day 1 tab, and scroll down to the 11.30am slot - you will find that there is now a talk from Srinivas Chennupaty of Intel. It is still a graphics talk but concerning 'Intel's High Performance Graphics solutions in thin and light mobile form factors'. A new report from SemiAccurate (paywall), via Fudzilla, might cast some light on the above wriggling around of Nvidia's schedules. Apparently Nvidia was simply too ambitious in its prospects for GPU sales. 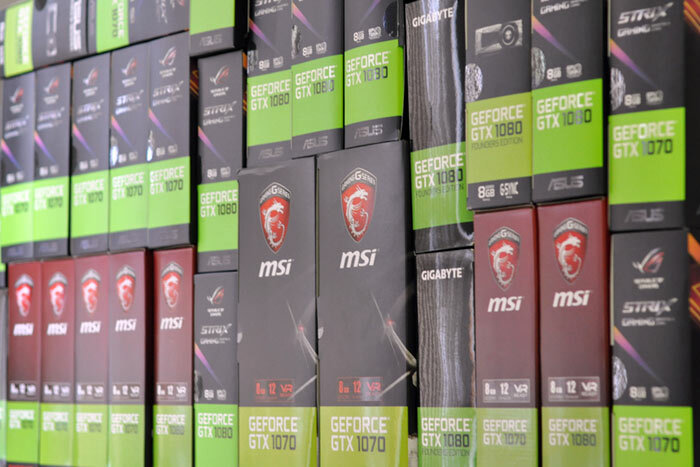 It was banking on pent-up gaming demand and the continuation of the cryptocurrency mining on GPUs trend. Unfortunately for the green team, both of these things seem to have dropped away. According to the SemiAccurate report, Nvidia has been forced to take back 300,000 GPUs from one of the 'top 3' Taiwanese OEMs. That leads one to think about what might happen with the other OEMs. Elsewhere in the report it says Nvidia has been aggressively buying GDDR5 because it has an excess stock of lower-end GPUs that need to be made into boards. In May, Nvidia boasted how its revenue was up two thirds on record data centre business and strong video gaming card sales. It will be very interesting to see the next set of quarterly results which could include the impact of the reported stock returns, and more. Nvidia artificially kept production low to inflate prices, thinking the miner craze was going to last longer, even though anyone who spends literally an hour or 2 doing research could've told you it was going to take a dive and the card shortage wasn't because miners were buying them all, it's because stocks weren't kept full. Yes miners used a lot of cards, a disproportionate amount, but if Nvidia had actually filled demand at the time, instead of trying to play silly buggers, they wouldn't be in this spot. I would pay good money to see the reactions of whoever is in charge when they seen BTC prices collapse earlier this year, because that's when everyone realised the investment isn't going to get a return and stopped buying cards. The gaming GPU market seems to be stagnant at the moment, AFAICT. I wonder if that has something to do with lower support for multi-GPU solutions in games/drivers? So now the question is will they delay the 11/20 series cards for a while longer, or will they try to lower the prices of the 10 series so they can shift stock? I remember reading the article a few days ago,and it appears Nvidia might have delayed the new cards a bit to make sure the inventory will be sold off. It makes me wonder whether the GTX1100/GTX2000 series would have been out by now if this wasn't the case.